Writing a code in a text editor (or IDE). Compile it (if there is problem with our syntax, the compiler will tell us about it). Correct any problems found by the compiler (missing semicolon, brace, etc.). Run the code to test it. Later, we may find some problems that the compiler will not find (called them bugs). They are more difficult to find, but in our course we should not have to many problems of this sort. 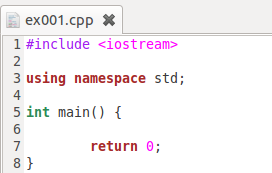 C++ is very fussy about details (syntax), so I advise that you type each code I present here watching every character (comma, semicolon, lef/right brace etc) as you do so. Do NOT copy and paste the code ever. You develop your skills by typing the code as well. You probably do not know what compilation is and there will be many things that will baffle you in the beginning. Do not worry about it now. Just take those things for granted. Explanations to those bits will come later. Now, it is all about repeating the process and having some fun with it From now on, you are the boss. Here is your initial code structure we will use starting every program (well, sometimes we will add some more stuff, but the below will always be present). If you use Microsoft Windows and codeblocks IDE, just open a new project, type the code in and save it. Then click the icon in the menu that has a green arrow similar to the one used on DVDs ;). If you see no errors in the bottom of the page we're good.